Let's just dive right into some code. We start with some constants, beginning with the constant PI. I have no idea what this constant was supposed to be when I wrote it. I know that pi is some kind of Greek letter, but where the heck did I come up with 3.14159? If I'd spelled it "PIE", then it might make a little sense. As it is, this constant is just a mystery to me. Next, we have the number of guys that are running around on the terrain. We have a constant indicating the width of the terrain, after scaling it. There's also a constant indicating the amount of time between handling collisions. As in the lesson on collision detection, we'll alternate between advancing all of the guys by some amount of time and handling all of the collisions betweeen guys. So TIME_BETWEEN_HANDLE_COLLISIONS is the number of seconds by which we advance the guys between handling collisions. This function returns a random value from 0 to 1. //-height / 2 to height / 2. Now we have our Terrain class and the loadTerrain function, which are exactly the same as in the lesson on terrains. We have a new function called heightAt, which determines the height of a terrain at a particular fractional (x, z) coordinate. We'll do this by taking a weighted average of the four heights of the grid points for the grid cell in which the point lies. This is a little different from the height indicated by the way we draw terrains; if you remember, we broke up each grid cell into two triangles when drawing them. But if the terrain is sufficiently smooth, it shouldn't matter very much. Anyway, I think that the weighted average approach gives a more appropriate height. First, the function makes sure that (x, z) lies within the bounds of the terrain. Next, heightAt computes leftX and outZ, which indicate the grid cell in which (x, z) lies, and fracX and fracZ, the distance from (leftX, outZ). We determine the four heights of the grid cell in which (x, z) lies and return a weighted average of them. Each block guy will keep track of some information about itself. They'll have their own advance and step methods. The state of each guy will be updated over small intervals of time, each interval having a duration of GUY_STEP_TIME seconds. Here's our Guy class, which keeps track of all information regarding a single block guy. Each guy stores the terrain on which he's walking and the model for a guy. Each guy stores a scaling factor for the terrain, the amount by which it is scaled so that it is TERRAIN_WIDTH units wide. They also keep track of their positions. Each guy has a field indicating its position in the current animation. If you remember from the lesson on animation, our MD2Model class had an advance method indicating the current position in the animation. However, in this program, each guy will be at a different position in the animation. For this program, I've altered the MD2Model class by removing the advance method, and by changing the draw method to take as a parameter the animation time. The radius0 field indicates the approximate radius of a guy. This number will be used to determine the amount by which to scale the guy when we draw him. It'll also be used for collision detection; we'll approximate each guy as a cylinder for the purposes of collision detection. We have a few more fields here. speed indicates the speed of the guy in units per second. angle indicates the direction in which the guy is walking, such that 0 indicates the positive x direction and PI / 2 indicates the positive z direction. This is the way that angles are frequently represented in the x-y plane (although technically we're concerned with the x-z plane). timeUntilNextStep is the amount of time until we next call step(). Each guy is turning either left or right while he walks. isTurningLeft indicates the direction that a guy is currently turning. Every so often, each guy will change directions; timeUntilSwitchDir is the amount of time in which a guy will switch. Here's the step method for guys. First, we take care of updating information regarding the direction the guy is turning. We compute maxX and maxZ, which indicate the farthest the guy can be in the positive x and z directions. We increase the x0 and z0 fields to move the guy forward. The velocityX() and velocityZ methods, which we'll see later, give us the velocity of the guy based on his speed and the direction he is walking. If the guy has now exceeded an edge of the map, we move his to the exact edge of the map and set the hitEdge variable to true. This code makes the guy turn, by adjusting the angle variable. If the guy is at the edge of the terrain, he turns more quickly, so that he doesn't face the edge of the terrain for very long. These two while loops ensure that angle lies between 0 and 2 * PI. The constructor for the Guy class just initializes some variables, some of which are set to random values. The advance() method advances the state of a guy by a given amount of time. It just changes animTime and calls step() the appropriate number of times. This method takes care of drawing one of our blocky friends. If the model is NULL, we don't draw anything. Otherwise, we translate, rotate, and scale, and then call draw on the model. The scaling factor is proportional to the radius of the guy. The translation moves to the location of the guy. It calls the y() method that we'll see later, which uses heightAt to find out the height of the terrain at the guy's position. You'll notice that we're moving a little above y(), since we need to move above the surface of the terrain to the center of the guy. After translating, we rotate by 90 - angle * 180 / PI, in order to have the guy face the direction that he's walking. We have to take 90 minus the angle for it to work. This is because a rotation of 0 would have the guy walking in the positive z direction, whereas an angle of 0 indicates that the guy is walking in the positive x direction. So basically, this converts from the angle variable to the amount of rotation that we need. We set the color to white, so that we don't have any kind of weird coloring applied to the model. We do a couple of rotations that make it so that the model, which I oriented the wrong way when I made him in Blender, is oriented correctly. We have methods for returning the position of a guy. The y() method uses the heightAt function to figure out the vertical position of the guy. These methods tell us the velocity of the guy in the x and z directions. //Returns the angle at which the guy is currently walking, in radians. //PI / 2 indicates the positive z direction. These methods return the radius and angle of a guy. The bounceOff method is used for handling collisions. It makes the guy change direction so that he bounces of another guy. It operates similarly to the bouncing in the program on collision detection, but works in two dimensions. It computes the direction from the first guy to the other guy, takes the dot product of that vector and the velocity vector, and subtracts twice the dot product times the direction from the velocity. It uses the resultant vector to determine the new angle in which the guy will walk, using the atan2 C function. atan2 just returns the angle of a vector, where the first parameter is the y component of the vector and the second parameter is the x component of the vector. Next, we have a bunch of code related to collision detection. We have a GuyPair function which stores potential collisions. For this program, we're using a quadtree for collision detection, the two-dimensional analog of the octree we used in the program with all of the bouncing balls. We have some parameters for the quadtree indicating when to divide or un-divide a particular quadtree node. We've been through octrees before, but let's run though our Quadtree class to make sure that we still understand how everything works. We have the minX, minZ, maxX, and maxZ fields, which indicate the rectangle for a given node, and centerX and centerZ, the coordinates of the center of that rectangle. * children with x coordinates ranging from minX to centerX. We have the children field, which is a two-dimensional array of Quadtree objects storing the children of a node, if there are any. The hasChildren field tells us whether a quadtree node has any children. The guys set stores all of the guys in a node, if the node has no children. depth indicates the depth of a node in the quadtree. numGuys is the number of guys in a node or any of its children. fileGuy figures out in which of the children a particular guy belongs and either adds the guy to or removes the guy from these children, depending on whether addGuy is true. The haveChildren method divides a quadtree node, placing all of the guys into four new child nodes. The collectGuys method puts all of the guys in a particular node or any of its children into a given set. The destroyChildren method un-divides a quadtree node by collecting all of the guys in its children into the guys set and deleting the children. The remove method removes a guy at a particular position from a node. It calls destroyChildren if the node has few children. It then either uses fileGuy to remove the guy from its children or just removes the guy from the guys set. //Constructs a new Quadtree. d is the depth, which starts at 1. We have our constructor, which initializes some of the fields. The destructor deletes the children if there are any. The add method divides the quadree node if there are too many children. It then either uses fileGuy to put the guy into the appropriate children, or it adds the guy to the guys set. This remove method calls the other remove method to remove a guy from his current position. The guyMoved method is called whenever a guy's position changes. It operates by removing the guy at his old position and then adding him again. The potentialCollisions method figures out possible collisions between pairs of guys. It recurses on the children if there are any and takes every pair of guys otherwise. The potentialCollisions function just calls the quadtree's potentialCollisions method. testCollision determines whether there actually is a collision between two particular guys. A collision occurs when the distance between the guys is less than the sum of their radii, and the guys are currently moving towards each other. 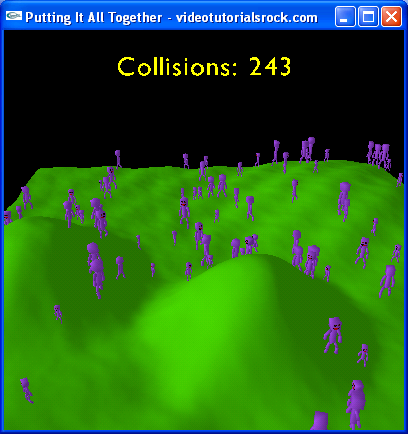 The handleCollisions function goes through potential collisions and finds the ones that are actually collisions. For each collision, it makes the guys bounce off of each other using the bounceOff method, and increments a numCollisions variable, which stores the total number of collisions that have occurred. If you remember from the screenshot at the beginning, we'll be displaying the total number of collisions, so we need to keep track of this amount. This function takes care of moving the guys over a certain interval of time, by calling advance on the guys and calling guyMoved on the quadtree for each guy. The advance function moves the guys over a certain interval of time, by alternately using moveGuys to advance the guys an interval of TIME_BETWEEN_HANDLE_COLLISIONS and calling handleCollisions. makeGuys constructs and returns numGuys new guys. The drawTerrain function takes care of drawing the terrain. The code is the same as the code from the lesson on terrains, although if you remember in the terrain lesson, this code was in the drawScene function. The drawNumCollisions function will take care of drawing the total number of collisions at the top of the screen. First of all, we'll use string streams to get a string that reads "Collisions: 500", or whatever the number of collisions happens to be. We used #include <sstream> at the top of main.cpp to include string streams. You can use the << operator to add to the end of an ostringstream. So, we add "Collisions: " to the end of a new string stream, followed by numCollisions. Now, the string stream has what we want. To get a string containing its contents, we call str() on the stream. This method returns a C++ string object rather than a character array, a C-style string. C++ strings behave a lot like character arrays; in fact, you can access the character array for a string object by calling c_str(). Now we do our OpenGL thing, translating, coloring, pushing and popping, all that business. We have a call to t3dDraw2D to actually draw the string, which we will have center-aligned both horizontally and vertically. As usual, we have a bunch of variables, which are mostly self-explanatory. _angle is the camera angle, and _timeUntilHandleCollisions is the amount of time until we'll next handle collisions. The cleanup function deletes the model and the Guy objects, and calls t3dCleanup() to tell the text drawing functionality to dispose of its resources. In initRendering, we call t3dInit to set up the text drawing functionality. We load the model (which I created in Blender). The model file is named blockybalboa.md2, as our block guys are named Blocky Balboa. Then, we switch to the running animation. The drawScene function for the most part calls drawNumCollisions, the Guy class's draw method, and the drawTerrain function. update increases the camera angle and calls advance to advance the positions of the guys. The main function takes care of loading the terrain, creating all of the guys, and setting up the quadtree. So that's pretty much a run down of the program. Hopefully, all this jaberring has helped solidify what you learned in the last few lessons.